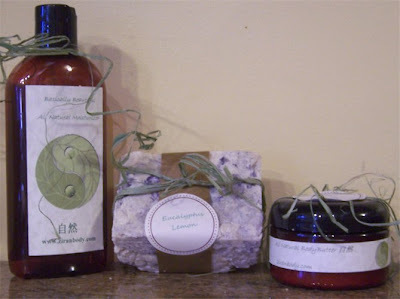 Zi Ran Body recently sent me some samples of their all natural bath & body products to try, and I'm excited to share this 'new to me' line with you today. Let me tell you a bit about Zi Ran before I share my reviews with you...this is a fairly new business created by Stephanie and her husband John, who according to Stephanie, "are really into natural products that contain minimal to no chemicals." John makes the soaps, while Stephanie focuses on the lotions and body butters. Their products are made fresh for each order. The packaging is simplistic, yet I think it's artistic at the same time. Their pricing is extremely reasonable, as you'll read more about as each product is discussed. 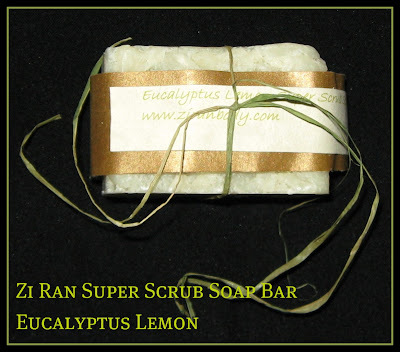 Above: The Super Scrub Soap Bar is offered in a Eucalyptus Lemon scent and comes in a 5.5-6.5 oz. bar. Size-wise, that's a big bar of soap! These are priced at $5.50 each, and are also offered in a 3-pack for $15.00. The scent smells equally of both scents, and other ingredients include Extra Virgin Olive Oil, Organic Virgin Coconut Oil, Almond Oil, Jojoba Oil, Purified Distilled Water, Raw African Shea Butter, Tallow, Vitamin E, Grapefruit seed Extract, Lye. Essential Oils (Lemon Oil, and Eucalyptus oil at the moment). Those ingredients make this a highly moisturizing soap that lathers up very nicely, leaving no residue. The scent is both invigorating and calming at the same time. I adore natural/organic soaps, but I find that many of them melt quicker from the shower steam. I'm happy to report that this one is holding up very nicely and lasting well. Above & Below: The Basically Beautiful body lotions and All Natural body butters are currently available in 4 scents, Rain, Pumpkin, Exotica, and Snowy Seduction (not shown). The lotion is also available in an unscented version. The lotions come in an 8 oz. 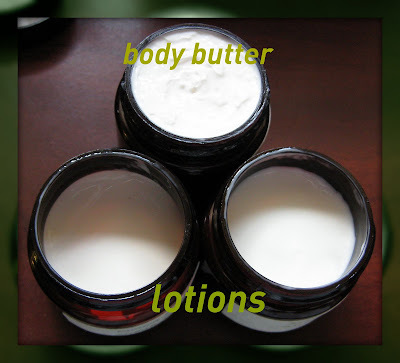 bottle and are priced at $7.50, while the body butters are packaged in a 4 oz. tub and priced at $8.50. The lotion ingredients are Aloe Vera Juice, Organic Virgin Coconut Oil, Grapeseed Oil, Cocoa Butter, Honey, Emulsifying wax (vegetable derived), Vitamin E, Grapefruit seed Extract, Essential Oils (fragrance of your choice). The body butter ingredients are Purified Distilled Water, Organic Virgin Coconut Oil, Almond Oil, Raw African Shea Butter, Emulsifying wax (vegetable derived), Vitamin E, Grapefruit seed Extract, Essential Oils (fragrance of your choice). The lotions I sampled were Rain and Exotica. The consistency of the formula is what I would consider of medium thickness, leaning ever so slightly to the thinner side. They're very smooth and silky, absorb quickly and maintain the moisture and scent on my skin almost all day. Both of the scents I sampled have a light enough fragrance that you can wear them alone, or apply your perfume without interference from the lotions. You can read more about the scent's notes on their web site, but I can tell you that these both smell amazing. Rain is an aquatic scent, clean and light, but with a delicate fruity and floral scent balanced nicely with musk and sandalwood. Exotica is a little more...well, exotic! Patchouli and sandalwood sweetened with frankincense is how it's described by Zi Ran, and I'd agree with that. It's a rich, deep and mysterious scent. The body butter I tried was Pumpkin Butter, a seasonal scent offering. The texture is fairly thick, as a butter should be, but not so thick that it's difficult to apply. This literally melts right into my skin and isn't greasy like some butters I've used. The butter's scent seems to last longer on me than the lotion, and I find that to be the case with any brand that I have both a lotion and butter with identical scents in. And the scent of Pumpkin Butter...on my...I'll warn you that this one will leave you hungering for pumpkin muffins! It may also cause you to sniff yourself excessively throughout the day! With a touch of cinnamon, nutmeg and clove added to the warm pumpkin scent, this one is delightful. The photo above was taken from their web site to show you how they're packaged. That particular pack includes all three of their products and is offered at $20.00. I know what my daughter's teachers are getting for Christmas! Zi Ran uses a natural approach when it comes to packaging also, utilizing recycled plastic for the containers, and recycled paper for their shipping materials. You can find their location on all of the social networks (Twitter, Facebook) here. My impression of Zi ran and their products is extremely good. The quality seems very high, the results (how well they moisturize, the scents and how well they last) were definitely well above average, their ingredients are impressive and indeed very natural, artisan-like packaging and products, and very reasonable pricing. I look forward to new scents that I'm sure they'll be adding, and I'm also hoping they'll offer their soap bar in additional scents. The Snowy Seduction seasonal scent was just added today, so I can assure you that I'm ordering that for myself when I order some other products for Holiday gifts! *Products featured were furnished by the manufacturer of PR firm for review. Yeah, homemade soaps tend to melt faster than commercial brands cause commercial brand soaps add some hardeners such as stearic acid and such. It also depends on the oil used to make the soap. THere are soft oils and hard oils. The larger the ratio of hard oils, the harder the soap bar. Soaps need some time to sit around to "cure" and the longer the cure, the harder the bar becomes cause the water content that it is made with evaporates. So compared to a freshly made bar of soap, shrinking is less noticeable. Yeah, I've made soap before. I did it as a hobby. It's an expensive hobby though! Nice review! These are amazing! Don't forget to check out my Christmas Giveaway if you haven't already. Have a great Saturday! Blondie~these are really nice products, very impressed. Martje~I do too, simple and artsy! Akuma Kanji~love the texture of this butter! The scent is unreal and I'm excited to get the other scents in the butter. Chloe~I love natural products. Thankfully I don't have skin problems, but I always find natural products to more more moisturizing.